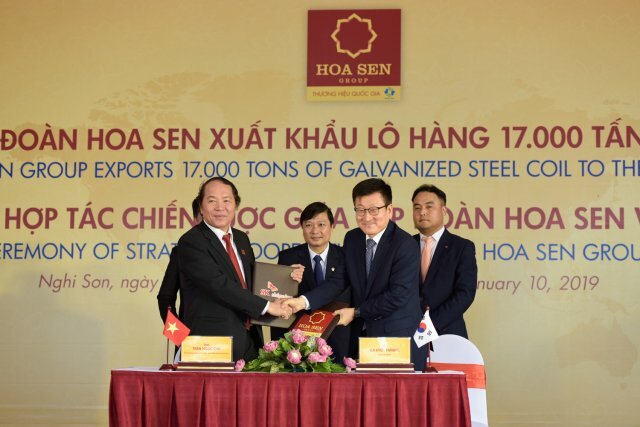 At a ceremony for the export of 17,000 tons of Hoa Sen Group’s steel sheets to the US on January 10 (Photo: Hoa Sen Group). First shipment to US this year heads out on January 10. The Hoa Sen Corporation shipped 17,000 tons of steel sheets worth over $14 million to the US on January 10 from Nghi Son Seaport in north-central Thanh Hoa province. This is the corporation’s first batch of exports to the US this year. Its products are now available in more than 75 countries and territories, including many with strict requirements on product and service quality and delivery times, such as the US and the EU. The group began to export to the US in 2014 and has seen notable development since. In the context of rising trade protection and the narrowing of steel sheet exports to major markets like the US and the EU, the group has been able to maintain its exports to the US, proving the competitiveness of the Hoa Sen brand in the international market. The group’s steel output in 2017-2018 exceeded 1.9 million tons and revenue stood at VND34 trillion ($1.45 billion), up 13 per cent and 32 per cent, respectively, year-on-year. Both domestic and export revenue recorded outstanding growth, of 34 and 27 per cent, respectively, and after-tax profit was VND410 billion ($17.6 million). Export earnings exceeded $538 million, up 27 per cent year-on-year. The group also signed a strategic cooperation agreement on January 10 with South Korea’s SK Group, which owns SK Shipping - a leading global shipping group with over 30 years of experience. SK Shipping will be a strategic partner of Hoa Sen in transporting its exports to international markets, contributing to improving competitiveness. Hoa Sen will devise measures to effectively address financial issues while accelerating the restructuring of its distribution system towards maintaining its Number 1 position in galvanized steel sheet in the domestic market and expanding its export markets.